Vancouver wedding photographers Povazan Photography - Best Vancouver wedding photographer Jozef Povazan Photography studio. Vancouver wedding photographers Povazan Photography. How to become one of the best Vancouver destination award winning wedding photographer? Simply create images for brides and grooms which fascinate not just them but family and friends and other photographers too. How to create fearless award winning pictures? 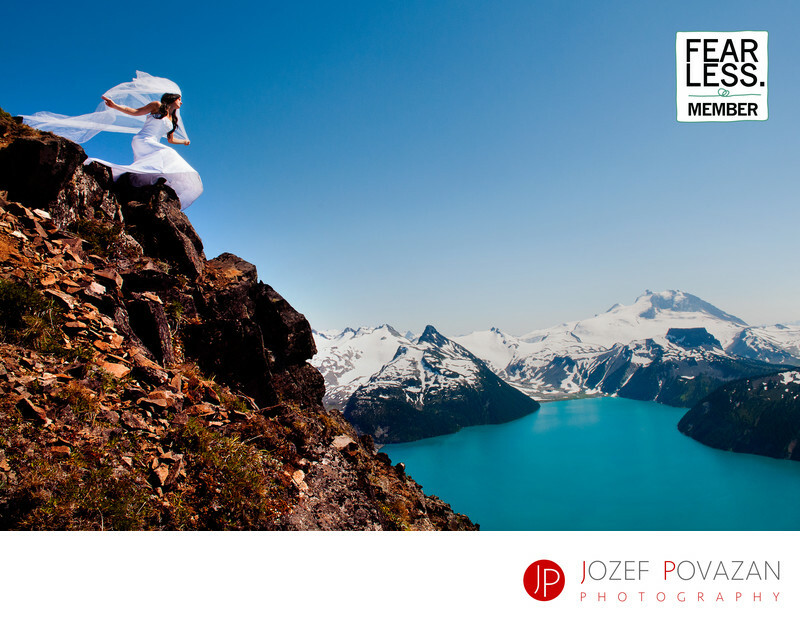 This image of a Bride above Garibaldi Lake on the top of Panorama ridge is a great example. Scenic, unique, fearless picture of a girl in her wedding dress with veil flying over the glaciers in this popular provincial park. I love to hike with my family so when I have a client who is determined to do whatever it takes to get this kind if amazing pictures with beautiful west coast mountain and glaciers views then I am thrilled to photograph them. This was a long day hike. We started early in the morning and it took us almost 7 hours to get to this view and have the images done. We had a perfect light conditions, and on the way back we stopped at Garibaldi lake to create some more interesting and cool looking images. The whole day was 14 hour workout but to get images like these unless you have a helicopter you just have to do it. Best wedding pictures from Vancouver wedding photographer Jozef Povazan and more full stories from top destination weddings can be found on our blog. Location: garibaldi lake panorama ridge garibaldi provincial park. Keywords: Vancouver wedding photographers Povazan Photography (3).